fiestavike wrote: Oh I know! I think you thought the Vikings had a better QB the moment Bridgewater went down. No, because Shaun Hill was the QB at that point and he was definitely not a better option than Bridgewater. Bridgewater is very likely NOT going to be as mobile anymore, IF he can even come back. Losing mobility, and being fragile, on a team with a very suspect front line is a recipe for disaster. Mothman wrote: We never saw him beyond the preseason so none of that supposed improvement was ever evident in a meaningful game. The thing is, BW took it upon himself to work on his weaknesses. That's the kind of qb the Vikings lost. That's why I believe Zimmer was so high on this kid. 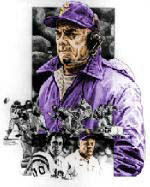 808vikingsfan wrote: The thing is, BW took it upon himself to work on his weaknesses. That's the kind of qb the Vikings lost. That's why I believe Zimmer was so high on this kid. He's been highly dedicated, no doubt about it. My god, the Bridgewater hate is off the charts in this thread... Can we give the coaching staff any benefit of the doubt on evaluating a healthy Bradford vs a healthy Bridgewater when/if the time comes? Teddy did have some part in them winning 11 games and the division in 2015 as a sophomore QB with an offensive line that was similarly atrocious as the one Bradford was working with last season. There's not much new here other than the sentence I highlighted. And Spielman said the team has no timeline on the return of Bridgewater from the devastating knee injury he suffered last year in training camp. Over the next few weeks, we should at least get a slightly better idea of how the Vikes intend to approach the position in 2018. At that point, we'll know if they've drafted a QB and we'll know if they've picked up Bridgewater's option. Mothman wrote: There's not much new here other than the sentence I highlighted. It would be nice to see the Vikings commit to Bradford sooner rather than later. Pepper2Moss wrote: My god, the Bridgewater hate is off the charts in this thread... Can we give the coaching staff any benefit of the doubt on evaluating a healthy Bradford vs a healthy Bridgewater when/if the time comes? Teddy did have some part in them winning 11 games and the division in 2015 as a sophomore QB with an offensive line that was similarly atrocious as the one Bradford was working with last season. But his stats didn't look that good, and the teams offensive ranking was low. fiestavike wrote: But his stats didn't look that good, and the teams offensive ranking was low. ... because he played poorly. Mothman wrote: ... because he played poorly. With all due respect, you base that opinion on the implications of the stats and rankings, not on the actual play, on the actual field, in the actual conditions, and actual situations. All of which helped to contribute to an 11 win season with a less talented team than the one that just went 8-8. Your emphasis on the "results" seems to depend whether it furthers your argument or gets in the way of it. If the former, its all that matters. If the latter, you retreat to obfuscations about the complexity of all the various factors (which is a fair point). The only way out of that trap is actual knowledge and expertise. But that would tell you that Teddy Bridgewater is actually a damn good QB, which is simply untenable. Who hates Teddy? Who said they hated him? I didn't see it. Some have been critical of his play, maybe, and justifiably I might add, but no one has even said they don't like him. Remember, Christian Ponder looked good in the preseason too, and even TJack did too. And who even cares anymore, because the chances of him even being able to run and jump are slim let alone scramble or throw effectively. fiestavike wrote: With all due respect, you base that opinion on the implications of the stats and rankings, not on the actual play, on the actual field, in the actual conditions, and actual situations. As I've explained to you before, there's a difference between using stats and rankings as tools to illustrate points about his play and actually basing my opinions exclusively ON those stats and rankings, which I don't do. I've seen every pro game Bridgewater has played, a couple in person. My opinion of his abilities is based primarily on personal observation. The only way out of that trap is actual knowledge and expertise. But that would tell you that Teddy Bridgewater is actually a damn good QB, which is simply untenable. You're right, the idea that he is a "damn good QB" is untenable. There's too much evidence to the contrary for that assertion to be unassailable. By what measurable or observable standard is Teddy Bridgewater "a damn good QB" (and keep in mind, either standard requires the consideration of actual results)? PurpleMustReign wrote: Who hates Teddy? Who said they hated him? I didn't see it. Some have been critical of his play, maybe, and justifiably I might add, but no one has even said they don't like him. That criticism is the "hate", Josh. You're right, the idea that he is a "damn good QB" is untenable. It would be untenable to you regardless of any and all evidence to the contrary. I don't think there's cause to go much further down this road, because truthfully I don't really believe you are able to make an accurate analysis. fiestavike wrote: It would be untenable to you regardless of any and all evidence to the contrary. That's not true at all. I have nothing personal against Bridgewater. The only problem I've ever had with him is that he isn't actually a "damn good quarterback". Please stop trying to make this personal.